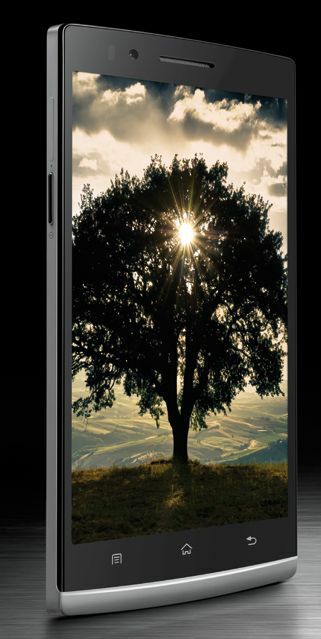 For their first flagship, which is Oppo Find 5 it has many WOW factors, such as Quad Core Krait processor, 13 MP camera, 2 GB RAM, Jelly Bean OS, 5” screen with 1080×1920 pixels resolution and so on. With the price not so different with Samsung Galaxy SIII is one of the proof that Oppo is a quiet confidence to battle. What are the advantages and disadvantage of Oppo Find 5? Let’s find out more in this review. Oppo Find 5 has measurement 141,8 x 68,8 x 8,9 mm and weight 165 Gram. The body is pretty thin, just 8,9 mm thick plus the curve at its back side given more thin impression. The left and right bezel is also thin, make this Smartphone not so wide. It feels solid when we hold it. It shows good build quality even though it’s a little bit heavy (but not much). On the left side there is Power Button and also Micro SIM slot. On the right side there is Volume button. At the bottom there are Micro USB port and mic hole, at the top side, there is 3.5 mm headset jack. On the backside, there is 13 MP camera lens + flash. Oppo Find 5 battery is non removable by the user. Oppo Find 5 use 5” screen size with 1920 x 1080 pixels screen resolution. Those resolutions are a common resolution used by 32”-47” HDTV, so you can imagine how smooth this phone’s screen is. It’s equipped with IPS (in-Plane Switching) technology, thus give the user a good viewing angle. The screen is protected by Gorilla Glass 2, make it more scratch resistant. The Oppo Find 5 screen has good color and contrast. The operating system used on Oppo Find 5 is Android Jelly bean (4.1) with some customization by Oppo, so the look its not like standard JB. Switching between menu is smooth and without lag. Well, it’s still sometimes there is a very little delay when we do some task, for example when we switch from app drawer to the home screen. It happens especially when we open many apps at a same time. However, this condition is common happen on Android OS and it’s not a big issue. The chipset used by Oppo Find 5 is Qualcomm Snapdragon APQ8064 S4, CPU Krait Quad-Core with 1.5 GHz clock speed + 2GB RAM and Adreno 320 GPU. This Android phablet has specification that can compete with some well known and global brand Such as Samsung, HTC, LG, Sony and Motorola. When it tested by synthetic benchmark app AnTuTu, it gives a score above 15.000, better than Galaxy Note II and Nexus 4. When it tested by Quadrant Standard, it gives a score above 7000, better than Samsung Galaxy SIII. Benchmark application is not an exact measurement and not represent actual performance because there are still many other factors involved. However, for 3D performance, it is natural that Find 5 Perform better than Galaxy SIII or Galaxy Note II, this due the GPU used in those Samsung droid -which is Mali 400 series- is quite old nowadays. Oppo Find 5 video player is quite standard. It can play Full HD 1080p MP4 video without a problem. But when we try to play MKV file, the player is not responding. To overcome this problem is very easy, the user just has to install third party application such as MX Video Player for free from Google Play. At the Audio sector, Find 5 included Dolby Mobile and Dirac HD technology that’s commonly used on high end audio devices. This feature only benefit when the user uses a headset. The loudspeaker is loud and clear. When we use headset, the sound produced is good but not special. Oppo Find 5 has 13 MP rear camera that can produce images up to 4308 x 3120 pixels. Equipped with flashlight to take photos in low light condition. While the front camera has 1.9 MP resolution. The result image is quite good, although not the best even when compared with the good quality 8 MP shooter. The image’s color looks accurate and natural. Some of camera features are: touch focus to determine focus by touching objects on the screen, burst mode that allows to take multiple photos with a single touch and HDR mode. Find 5 does not have a dedicated camera button, but it can be set to take pictures using the volume button. Oppo Find 5 Cand record 1080p video at 30 fps. In 1080p, the resulting video looks a bit less sharp, but on the other hand it’s smooth and have an accurate color display. HDR feature can also be used in video recording, this is a pretty rare thing to find nowadays. HDR feature works fine when used to record, it shows good contrast and detail without adding noise. One excellent feature that we found while reviewing Oppo Find 5 is it can record VGA video (480p) with up to 120 fps frame rate. Users can also set whether you want to record with high frame rate mode (120 fps) or with slow motion mode (30 fps). When recording with a high frame rate mode, the recorded object movement looks very real, suitable for recording fast moving objects such as a sports activity. When used to record in slow motion mode, the objects will move at half speed but the object still remains in their original form (still have a proportional shape or not blurry). Oppo is a rather new player in Smartphone world, but the products offer high performance component with impressed build quality. One of their flagship product is Find 5 series, sold with a price range not so much different with Samsung Galaxy SIII. Judging from the overall performance, there are no significant shortcomings. Full HD Screen, 13 MP camera and the gadget powered by the latest Snapdragon chipset, it’s pretty hard to miss specs like that. Most perceived shortcomings are that Oppo Battery non uses replaceable and also does not have a Micro SD slot so users cannot add more space. On paper, the Oppo Find 5 specification is better than SIII or other similar product in the same price range. However, they still need to gain trust of people and that is the hardest part.